Quality school playgrounds are built to last for years, even with constant use five or more days of the week, most of the year. Eventually, however, all play areas feel the ravages of time and need to be updated. You may notice your school’s play area looking tired and faded. The colors are not as bright and the equipment looks worn. Your playground may appear dated, and this can mean fewer kids are enjoying the space at recess and after school. The weather and climate, as well as heavy play, can take a toll. You may also start noticing performance problems. With time, play equipment may start to deteriorate. You may notice rust, pests or find the equipment in need of maintenance and repairs more often. You may even need to replace some equipment as it breaks. Wood playsets can crumble, develop cracks or show other signs of wear. At this stage, you need to consider safety, as well as performance. There are many additional signs your play area needs a refresh. If children are less thrilled to be playing in the space or if your equipment is no longer as welcoming, you may need to make some changes, even if the play equipment is technically still looking good and is in good shape. As your school’s mission changes, you may also find your current playground does not meet your goals. Perhaps you want to encourage more cognitive development, and your teachers want to be able to take the teaching to the playground. Or, you may wish to develop a healthy level of activity at your school. You may need to bring your current playground up to date to align with these new objectives. Playworld makes it easy to update your play space with classic and innovative play equipment designed to help kids have fun while they learn. 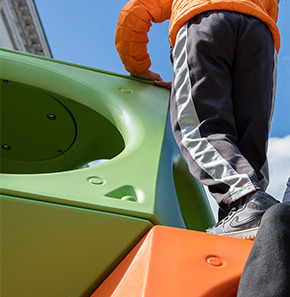 Adhering to current safety standards, our play equipment helps all children get in on the fun, and our friendly team is here to help you every step of the way, from planning your play space to choosing the right pieces, to budgeting and financing. When you are considering a school playground, you have a choice between buying new equipment and used play equipment, whether you are updating your existing play area or starting from scratch. Installing new playground equipment at your school comes with many benefits. New playground equipment developed today must adhere to current safety standards, which is crucial for keeping children safe, especially since more than 200,000 children visit the emergency room each year due to playground-related injuries. On any school playground, especially, safety must come first to reduce safety hazards for your students and to minimize liability. Playworld playground equipment meets or exceeds the safety standards of the top safety organizations in the industry, including those from the International Play Equipment Manufacturers Association, U.S. Consumer Product Safety Commission (CPSC), ASTM International, International Organization for Standardization, U.S. Access Board, TÜV SÜD America and Canadian Standards Association International. Another safety benefit of new playground designs that they are designed with lines of sight in mind. More modern play area design makes it easier to see all areas of a playground easily, giving teachers and others a chance to supervise more fully, keeping all kids safer. About 12 percent of the United States population has a severe disability, and various medical conditions can affect children’s ability to enjoy playgrounds. In the 1980s, playground equipment had to adhere to ADA standards to make it accessible to wheelchair users and to others with lower mobility. However, since then, our understanding of the way children use playgrounds has advanced. Today, child experts recognize accessibility may not be enough. While accessibility allows children of all abilities to access a playground, it does not always mean all children are included completely in play. An ADA-compliant playground may not promote inclusive play where children of all abilities can play together. This may mean not all children have equal access to the “coolest” pieces of equipment, which can create separation on the playground and in the classroom when kids do not play in groups together. Inclusion is a newer concept in playground design. Inclusive playground design allows all children to play together in one space, instead of creating a separate area. Children at different ability levels and ages can use inclusive play equipment according to their skills, confidence levels and mobility. Inclusive playgrounds can help break down barriers and give all children a chance to feel confident on the playground. For example, the AeroGlider™ is a glider that children in wheelchairs, younger children and older children can all use at the same time. These types of play equipment can also be a good value since more children can use them. Inclusive play equipment also allows teachers and parents with disabilities to access the playground and to help children. It allows for good lines of sight and plenty of room around each piece of equipment to fully support each child in play. The Accessible Swing Seat, for instance, offers extra support for kids, but can also be set up so adults on wheelchairs can get closer to any child needing some extra help. Finally, inclusive playgrounds in schools take into account much more than just physical differences. They create safe and cozy spaces for children who may get overwhelmed and need a break, while still offering teachers and staff good sightlines. They also allow for the creation of spaces where children can work on social skills. Inclusive play equipment really goes a few steps beyond just allowing children with disabilities to access the play area. Sensory development: Textured and bright play equipment, such as the Log Tube, appeals to a child’s sense of touch and sight, while play panels with music and sound, like the Music Center, can appeal to auditory senses. Appealing to multiple senses allows children to grow and to explore the world more fully. Physical growth: Activity panels can help children build fine motor skills, while swings, slides, climbers and other large pieces of equipment help children work on larger muscle groups, as well as on strength, coordination and balance. Play equipment can also encourage children to have fun with physical activity, which can make an active, healthy lifestyle more appealing to them as they get older. Emotional development: Play equipment designed today can help build confidence and self-esteem. Quieter areas on the playground give kids a place to handle difficult emotions in a healthy manner. The multi-generational Swing Along Seat is one example of a piece of equipment designed to promote emotional development, among other things. 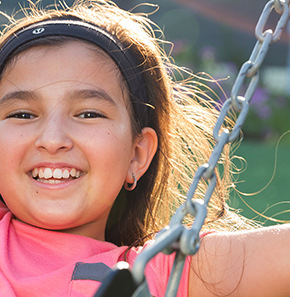 Kids in need of added support can swing with a teacher or caregiver and can develop a closer relationship with adults while learning to become more independent gradually. Social skills: Play equipment created to get children cooperating and working together can teach kids to set rules, share and work in tandem, which helps them build social skills they can use in the classroom and beyond. Cognitive development: Today’s play equipment can enhance what they learn in the classroom by continuing lessons during recess. The Art Panel lets kids build on the drawing skills they learn in art class, while the Nuvo™ Counting Insert lets children learn numbers and even practice counting. Learning how to use different pieces of equipment and playing pretend games with other children on the playground can also enhance problem-solving skills. New play equipment is designed with input from childhood experts and kids, so you are getting pieces that go further and help your students learn outside the classroom while encouraging healthy development during play. Manufacturers of new playground equipment work hard to design quality products and to support you every step of the way. New equipment comes with all needed parts, detailed installation instructions and even installation support. It also comes properly packaged to ensure it arrives intact and you are not missing any important pieces, allowing you to set up your play area correctly and safely. When you work with Playworld, for example, our team can answer all your questions and can work with you to design and build the playground you want. The team can ensure you have the right maintenance schedule and that your setup is correct. Our team can promptly address any concerns or questions, even after installation. Playworld even offers a planning guide for schools to make it easier for teachers, principals and administrators to make the right design choices. Playworld also has training sessions to help you and your team learn about play design, playgrounds, inclusive options and more. You can learn before you buy to ensure your budget dollars go as far as possible. If you have a committee working on developing the best playground, the extra support can make the difference between a functional play space and one that really serves each student while furthering your school’s mission. In the past, school playground equipment was just pretty much “there,” purchased without much consideration beyond the basic need for a play area. Today, manufacturers and educators take a much more nuanced approach to recess and playtime. We understand more about the benefits of play, and schools want to make playgrounds matter. A complement to your school programs — Playworld-designed playgrounds can help you build on what children learn in the classroom and in after-school activities. 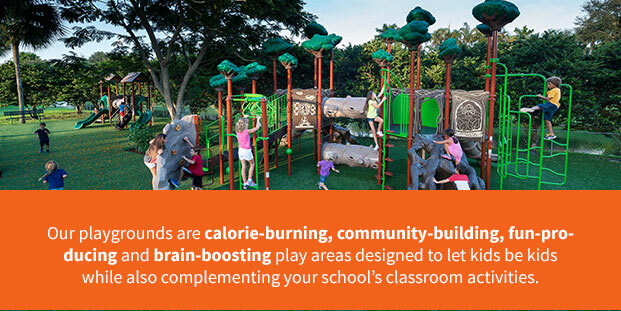 Enriching — Activity panels and playground equipment designed for cognitive growth help children learn while they have fun. Community-building — Inclusive playgrounds from Playworld help children get to know each other outside classrooms and let children engage together in play, which can help reduce bullying and let kids find common ground during recess. Fitness-promoting — Today’s parents and educators are concerned about screen time and the sedentary lives of students. According to the CDC, only 21.6 percent of children between the ages of 6 to 19 meet the recommended hour or more of at least moderate activity at least five days of the week. Playworld’s playground equipment makes physical activity fun and encourages children to move, which can inspire good habits when it comes to active play. Creativity-boosting — Creativity plays a role every day in good decision-making and in thinking outside the box. Quality playground equipment encourages children to use their imaginations and creativity. 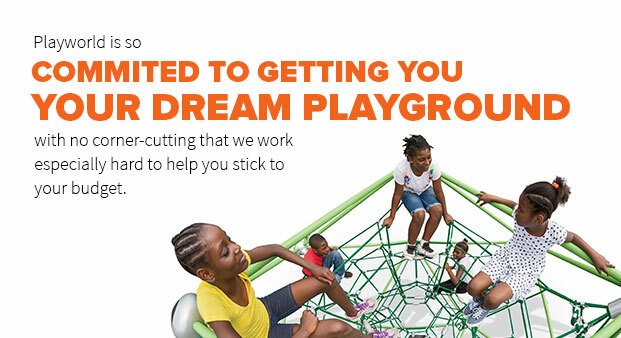 Playground companies like Playworld partner with nonprofits, industry experts, governments and nonpartisan agencies to make play more accessible to more children and to encourage play for kids. Playworld, for example, has been a staunch supporter of recess time and of inclusive play, as well as serving on organizations to make play equipment safer by establishing new safety standards. Quite simply, when you buy new playground equipment, you are creating a brighter future for playtime. When you buy new playground equipment, you choose the pieces that best fit your students’ needs. You can choose stand-alone pieces, full playsets or combine various elements to create the absolute right combination of play equipment. You can even build a playground in the school’s colors to build school spirit. Customizable playground equipment is not just important to create a better play experience. It may be important because of the limitations of your space. You may have a small footprint to devote to a play area and need a custom solution to offer as many activities as possible. Or, you may have an uneven playground or unusual terrain, requiring some customized support. 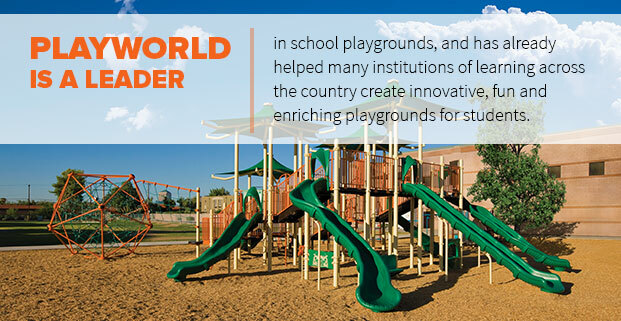 Playworld has design support to ensure you get professional input, and a personalized playground just for your students. When you purchase new playground equipment, you get new pieces that reflect the needs and interests of children today, so your students are excited to glean all the benefits of play. Today’s playgrounds go well beyond the classic swings and slides of years past to offer truly innovative pieces. For example, NEOS® Outdoor Electronic Playgrounds are inclusive playgrounds that combine the excitement of video games with outdoor play. These pieces include electronic components to spark the competitive spirit. Likewise, the KPE: Kid Powered Energy line is an electronic line of play equipment powered by children who spin, push buttons or otherwise interact with the equipment. Today’s playground has new design details to make using a play space more fun. There are shades to help keep kids cooler at recess and protect equipment from overheating. Sensory tactile playground components may be more pleasant to the touch, and slides with multiple slide areas allow kids to slide together. 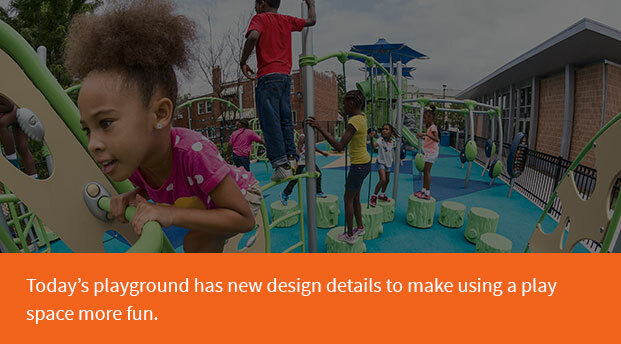 Up-to-date design details can often make playgrounds more functional and enjoyable, improving the experience for your students. New playground equipment can be customized to fit with your play area. Nature-inspired equipment or equipment that suits your surroundings can make your campus look more attractive and can mean elements of nature can be used with your playground. A more integrated playground can also get children discussing the world around them. For example, if your school is in an area with interesting rocks, the Challengers® Playmakers® Boulder Climber can help teachers launch discussions about geology. If your school is located near green spaces, the Nature Hunt Panel can launch talks about the animals that are native to your area. The decisions you make with installation and design can have a big impact on playground safety. For example, which surfacing do you need with your chosen playground equipment? What about use zones: How much clearance do you need around each item of equipment to avoid potential injuries? When you purchase new playground equipment, you get support for these questions and can even get a custom maintenance schedule for your school. Playground equipment is only part of the story when it comes to your school area. You also need benches so teachers and staff can supervise children comfortably, benches for school sports events, shade to prevent heat-related issues, litter receptacles to keep your schoolyard clean and more. When you purchase from a larger company specializing in playground equipment, you can buy these and other accessories and furnishings in one place, ensuring you get everything you need for your campus. New play equipment comes with warranties and after-purchase support. Even with the best-quality play equipment, things may go wrong or you may have questions. With new playground components, you have a warranty so you are covered and do not have to pay out of pocket for most repairs. If you need spare parts, it is easy to get them. If there’s a recall on any component in your playground, your manufacturer will contact you and make it right, so you enjoy greater peace of mind. A new playground can also grow with you more easily when you buy new products. If you have a question about maintenance or care, the manufacturer can help. As your school’s needs change and you need to update or add to your playground, it may be easier to purchase components that match the new play space you have created, especially since products in the same line may still be available. Of course, not all new playgrounds are made the same. If you decide to enjoy all the benefits of new playground equipment, choose a reputable brand and company. Playworld has helped many schools around the country build and update play spaces with quality pieces. We are dedicated to school playgrounds, and we are there with you every step of the way, helping you design your play space to helping you pick out the pieces and install them. When you’re thinking of updating your play area, buying used commercial playground equipment can seem attractive from a price point. You may already be buying many things pre-owned, such as vehicles or computers. However, when it comes to playground equipment, safety is a key consideration. Lack of warranty: New play equipment often comes with a full warranty, but when you buy used, you can never be quite sure when it will break. When previously owned school equipment does require repairs, the lack of warranty means any costs come out of the school budget. Unsafe materials: Older playground equipment may be coated or treated with toxic chemicals that can leach into your playground or be harmful to children. The CPSC conducted one study in which 16 of 26 playgrounds studied contained enough chipping lead paint to pose a safety hazard to young children. In addition, older wooden play structures may be treated with chromated copper arsenate, which is now a known carcinogen. Some wood play structures are even treated with arsenic, a poison. Unfortunately, used playgrounds often do not come with detailed information and data to help you ascertain whether any materials used are unsafe. Equipment which is not age-appropriate: What is considered age-appropriate has changed over the years. Today’s equipment takes into consideration fall heights and whether children can safely get to the bottom of a slide by themselves. When you buy older equipment, you may not even have the packaging and instructions to let you know what ages the play equipment is intended for. If you do have this information, it may not reflect modern ideas and standards of safety. Outdated materials: Slides made out of metals that scratch easily, wood which can splinter as kids climb and chains on swings that can pinch are just a few of the outdated design elements that can be less than beneficial when you’re buying used equipment. Recalls: Manufacturers have had to recall some playground equipment over the years because of design or manufacturing flaws. Unfortunately, these pieces may still be available on the open market, and you may end up buying them if you are purchasing used pieces. When you buy resold equipment, the manufacturer does not have your contact information and will not be able to inform your school you have purchased recalled or potentially unsafe play structures. Safety liability: Playground accidents are a serious concern, and older play equipment may not meet current safety guidelines or standards. Worse, previously owned equipment may have hard-to-spot or undetectable flaws which compromise its safety. No custom options: When you buy pre-owned equipment, you are buying pieces someone else bought to work with their playground. They may not fit with existing equipment, your available space or with your needs. You do not even get to pick the color! If you attempt to buy an entire playground with used pieces, you may not be able to build a coherent, attractive aesthetic. Shorter lifespan: Used playground equipment may already have many years of use and has been exposed to the elements. You can’t expect it to last as long as new pieces, due to the wear and tear. Lack of support: The manufacturers of used equipment may no longer be in business or may no longer offer support for older pieces, which can mean you are on your own when it comes to proper installation, maintenance and layout. Unfortunately, lack of support can mean mistakes that can affect the safety and performance of your school playground. Previously owned play equipment typically offers a no-frills purchasing experience, which can mean you have no one to ask questions and you will have no support for the maintenance and care of your new purchase. Availability of replacement parts: Manufacturers are unlikely to make replacement parts for older and previously owned equipment because each piece of equipment needs to meet current safety standards, and older playgrounds may not meet current safety standards. Older pieces may not be made anymore, and if you need a spare part, you may realize you cannot repair reused playground equipment. Risks during the reinstallation process: Playground equipment can become damaged in the process of uninstalling and reinstalling on your school playground. Important pieces may get lost, thus affecting the performance and safety of your school play area. Imagine, for example, the force needed to uninstall a slide or climber embedded in concrete. There is a high risk of damage and warping during the process. Lemons: Sometimes, when you purchase a house or car, you end up with a lemon, and the same is true for school playground equipment. There may be a reason why someone else got rid of a slide, climber or another piece of equipment, and you could end up paying for someone else’s mistake or poor purchase. Lack of instruction manuals: Installation instructions for playground equipment can be quite complex and contain vital safety information. When you purchase used, you will likely not get this crucial information, which can make it hard to install the playground correctly. You may not even be able to determine whether you have all the parts you need, and the instructions may not be readily available online. Hidden costs: The costs of pre-owned play equipment can be much higher than you expected. The cost of uninstalling and reinstalling on your campus can add significantly to the cost. You will also generally need to pay for shipping yourself, which can contribute to the price. Repair expenses may be higher and more frequent, too, since this equipment has more wear and tear. Over time, you may find used playground equipment does not help you realize any savings compared to new equipment after all! Outdated equipment: Understanding of children’s needs and development is changing all the time, and companies are always developing newer play equipment to reflect our current understanding. Newer play equipment can be more innovative, inclusive and designed to better accommodate how children play, so kids have more fun and get more benefit from their school playground. Older equipment is less likely to have the “wow” factor or the innovative designs which can get children really excited about play and creativity. Fortunately, if your main reason for considering used structures and play components is budget, Playworld has many options to allow you to get the latest play equipment without breaking the bank. We have a variety of financing options and we will work with you to help you get the equipment you need within your available budget. We offer free resources about budgeting, fundraising and other financing options so monetary concerns never have to stand in the way of creating a fun, inclusive, safe and enriching playground kids will be able to use for years to come. There are multiple options to allow you to buy new playground equipment for your school. You may be eligible for grants and there are many fundraisers you can launch to get people interested in your school while also raising money. Phase building is another consideration if budget is a concern. Phase building allows you to purchase pieces of equipment gradually, spacing out the costs. This option may also help you afford a quality new playground without settling for used equipment. Contact us today to talk about your needs to find out what we can do on your budget. Inclusive play design: Our playgrounds are designed to help all children enjoy the benefits of play. We can help you create a play space which breaks down barriers and helps children of different ages, abilities and medical conditions play together and learn together. Financing and fundraising options: Quality school playgrounds are an investment, and at Playworld, we believe all children should have access to quality play areas. We offer support in fundraising and offer financing options and free resources so you can not only get the playground you have always wanted for your school, but you can afford it, too. Safety and quality engineering: We craft our playgrounds with input from engineers and experts to ensure they reach the highest standards of safety and quality. All our equipment is made from the highest-quality materials and meets or exceeds all relevant safety standards. Careful testing and warranties bring you peace of mind. Exceptional service: Playworld understands buying play equipment for schools comes with special considerations. You need to thrill your students, reassure parents, work within a budget and impress school administrators. There are many people involved in the decision, and many voices to take into consideration. 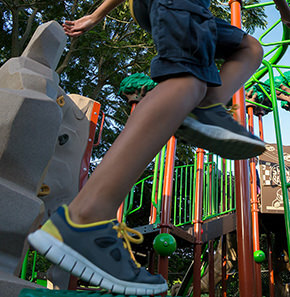 Playworld has a thoughtful and personalized approach to playground design. Whether you are upgrading or starting over, we can work with you to exceed your expectations. Our team is responsive and always willing to help. Playworld is a multi-generational, privately owned and operated company. In the business for more than 40 years, Playworld offers quality playground equipment manufactured in the USA and designed to adhere to the highest standards of safety and craftsmanship. We have a range of products for schools, including stand-alone pieces and our bestselling Playworld School-Age Playgrounds for the 5 to 12-year-old market. Our playgrounds for schools are active, community-building, fun-producing and brain-boosting play areas designed to let kids be kids while also complementing your school’s classroom activities. Do not just take our word for it: Take a look at the many schools already integrating Playworld options in their schoolyards with great success. We are leaders in sustainability and inclusive play, and we work with schools to ensure places of learning can buy and update playgrounds on their budget. When you work with us, you can feel good about the difference you are making for your students and for the future of play. Contact us today for a quote or browse our site to see some of the school campuses we have helped transform. Your comment will only be visible after moderation.